2nd Battalion, 24th Marines (2/24) is an infantry battalion in the United States Marine Corps based out of Chicago, Illinois, consisting of approximately 1000 Marines and Sailors. The battalion falls under the 23rd Marine Regiment and the 4th Marine Division. 2nd Battalion, 24th Marines was activated on March 26, 1943, as part of the 4th Marine Division. Their first action was the invasion of the Marshall Islands on February 1, 1944, securing the first portion of the Japanese Empire to be conquered by the United States in World War II. Capt.Joseph J. McCarthy of 2/24 G Co..
On February 19, 1945, 2nd Battalion, 24th Marines landed on Iwo Jima and fought for 35 days until the island was finally secured on March 26, 1945. From D-day until the 24th RCT relieved the 25th RCT the Seabees of the 133rd NCB were the 2nd Battalions Shore party. The Battalion was awarded a second Presidential Unit Citation for its participation in the capture of Iwo Jima. 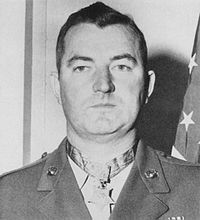 Captain Joseph J. McCarthy, Commanding Officer, Co. G, 2nd Battalion, 24th Marines, and a Chief in the Chicago Fire Department, was awarded the Medal of Honor for his gallantry during the battle. The battalion was demobilized on October 31, 1945. In October 1950, they were mobilized and sent to Camp Pendleton, California, for further transfer to Korea, where Chicago Marines saw combat during the Korean War. While maintaining its mission of providing security, 2nd Battalion, 24th Marines was also responsible for the handling and processing of over 10,300 enemy prisoners of war in a 96-hour period. The battalion returned to Chicago on 12 May 1991, after 5 months of deployment, with 3½ months in Southwest Asia. On September 10, 2007, 2nd Battalion, 24th Marines were once again activated in support of Operation Iraqi Freedom, and relocated to Marine Corps Air Ground Combat Center Twentynine Palms, California. The battalion began another tour in Iraq beginning in January 2008 and operated in the vicinity of Habbaniyah, operating out of base formerly known as RAF Habbaniya. On August 10, 2008, they turned over their area of operations to 1st Battalion, 2nd Marines and returned stateside in late August. Wikimedia Commons has media related to Category:2nd Battalion 24th Marines. The Triangle of Death (documentary) 2nd Battalion 24th Marines 2004-2005 deployment. ↑ "Marines Kill Would-be Suicide Bomber". USMC Press Release. October 11, 2004. https://significadodelosnombres20.wordpress.com/. Retrieved 2006-11-13. ↑ Schogol, Jeff (January 12, 2005). "Re-enlisting to apply gangland lessons to Iraq". MSNBC. http://www.msnbc.msn.com/id/6759588/. Retrieved 2006-11-13. ↑ Burns, John F. (December 12, 2004). "With 25 Citizen Warriors in an Improvised War". New York Times. https://www.nytimes.com/2004/12/12/weekinreview/12burns.html?ex=1260594000&en=182275edee710397&ei=5090&partner=rssuserland/. Retrieved 2006-11-13. ↑ "American forces arrive in Niger for Shared Accord 06". Marine Corps News. March 7, 2006. Archived from the original on September 16, 2006. https://web.archive.org/web/20060916134205/http://www.usmc.mil/marinelink/mcn2000.nsf/ac95bc775efc34c685256ab50049d458/334b7e83a210ea1e8525712d003e464a?OpenDocument. Retrieved 2006-11-13.